Newly released images show Former President George H.W. Bush's daughter Doro receiving the flag that draped her husband's coffin as he was laid to rest in Texas. 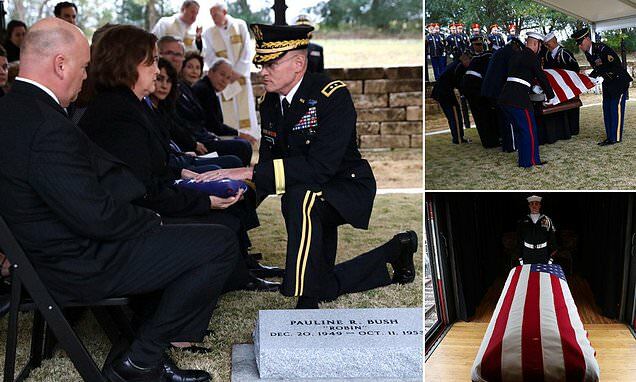 Emotional pictures issued on Twitter by Bush's spokesman Jim McGrath show his children walking behind the coffin to the burial plot where he was laid to rest beside his beloved wife Barbara and daughter Robin who died of leukemia aged 3. The flag was then presented to Bush's daughter, Doro Bush Koch, who was visibly overcome with grief and she took the flag from a solider. Texans turned out all along the 70-mile route to pay tribute to Bush, whose flag-draped casket was borne in a glass-sided train car pulled by Union Pacific locomotive 4141. For nearly three hours, crowds waved US and Texas flags, placed their hands on their hearts, saluted and took photographs and video, while firetrucks hoisted large flags on bridges over the tracks. The 41st president's son George W. Bush and his wife Laura, along with other members of the Bush family, watched somberly as a military honor guard carried his casket off the train. His flag-draped casket was wrapped with a plastic cover due to the rainy conditions. Bush's arrival came after an emotional service at St. Martin's Episcopal Church in Houston on Thursday morning. His body was then transported via the presidential train to the presidential library where he was laid to rest at a private ceremony.